The mission of Goshen High School is to establish a dynamic learning environment which is safe and accountable, and prepares our students for success with their life goals. Established in 1907, Goshen is located about ten miles west of Troy and ten miles east of Luverne. It is an incorporated town with an elected mayor and five council members. Goshen supports a volunteer fire department, three very active churches, several civic organizations, an excellent little league program, and a couple dozen businesses. Although the town itself numbers about 300 plus people, the actual school district boasts a population of around 2,000. All are very supportive of both Goshen Elementary School (grades K-6) and Goshen High School (grades 7-12). 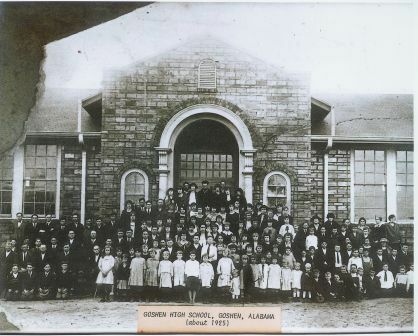 The earliest records indicate that educating children has always been a top priority for Goshen. The first small cluster of people who gathered at a high point in western Pike County in the mid 1800s, named the place Goshen Hill. It was located just north of Goshen's present site. Almost immediately, a community school was built. Called the Mount Zion School, this one-room structure was lovingly erected by local farmers from hand-split logs. The tiny schoolhouse supported one teacher and a handful of eager children of all ages. School sessions were held primarily from the late fall to the early spring when the children were not busy farming. In 1887, a railroad track was laid about two miles south of the community. It ran from Troy to Andalusia and greatly enhanced the local commerce. Seeing the advantages of a closer proximity to the railroad, much of the town just picked up and moved south. This new settlement was named Goshen. When they moved, they brought the old Mount Zion schoolhouse with them. After being placed at one other location, it came to rest beside where the Methodist church now sits on the corner of Academy and Stewart streets. As the population of Goshen grew so did the little school. Even with the addition of a second story, it was still so crowded that three and four grades had to be taught at the same time in one room. Ninety-four year old Lucy Sanders started school there in 1919. "I remember that we had to have two students sitting at each desk," Lucy recalls. "They'd sit boys with girls. So we'd just take our pencil and draw a dividing line right down the middle of the desk and tell the boys they'd better not cross it," she laughed. The entire community united in its efforts to raise enough money to build a new school and had a tough time doing it. Folks donated land, labor and materials. They held fundraisers such as box suppers, community plays and dances with fiddle playing. A group of women hauled a mule pulled wagon around going house-to-house gathering up old pieces of scrap iron and metal to raise money for the school. As soon as enough money was raised the community commenced to build another school, on the same site where GHS currently sits. It was completed in 1924, and the town could not have been prouder. The new school had four teachers who served all twelve grades. There was no indoor plumbing but it had nice big, multiple-seating privies out back. Water was drawn from a well, and the cozy classrooms were heated with large coal burning pot-bellied stoves. Alabama was hit hard during the Great Depression. It got so bad that the county could no longer afford to pay teacher. So once again the community raised enough money to pay them a meager monthly fee. On top of that, local families offered free room and board in their homes to the teachers. In the late 30s and 40s the first cafeteria was opened. The 50s and 60s brought indoor plumbing, a band room, a library and two new buildings. In the 1970s, as a result of the desegregation order, all junior and senior high school age children in the district attended GHS, and the Junior Reserve Officers Training Corps was established. In the 1980s a vocational agricultural business program was added. In 1992, to the sadness of the community, it became necessary to remove the original building and erect other structures in its place. Since then, Goshen High School has grown into one of the finest high schools in the area and supports over 400 students in grades seven through twelve. It now boasts such amenities as a large Computer Lab, a Research Library, the Global Studies Academy, a Career Discovery Lab, the Talent Search Program, Future Farmers of America and many other programs designed to boost the educational enrichment at GHS. We are all very proud of our school - its heritage and its accomplishments. We look forward to countless more successes in the future both for our school and our community.